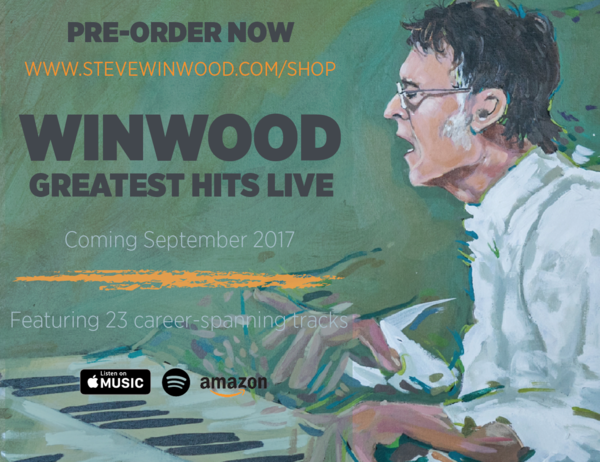 ‘Winwood: Greatest Hits Live’ is a new 2CD/4LP collection sourced from Steve’s personal archives of live performances. With a 23-song tracklist handpicked by Steve, featuring his best-loved songs, ‘Greatest Hits Live’ offers fans a definitive musical portrait of his five-decade career. The expanded 2CD/4LP gatefold package features rare, previously unreleased material touching on all aspects of Winwood’s extensive catalog, including contemporary arrangements of the music he created with the Spencer Davis Group, Traffic, Blind Faith, and on his classic solo recordings. 'Winwood Greatest Hits Live' is available now for pre-order at Apple Music, Amazon, iTunes, and Google Play, and will be released September 1st on Wincraft Records. Each vinyl set includes a digital download card. Catch Steve on tour this Spring, Summer and Fall in the US, UK and EU - click here for a full list of tour dates.